Contact Carr Valley Cheese Today! Owned and operated by the Cook family, Carr Valley Cheese Company is over 100 years old. Nestled amongst the rolling hills and lush pastures of central Wisconsin, Carr Valley Cheese remains one of Wisconsin's traditional cheese plants, famous for making cheese the old-fashioned way. 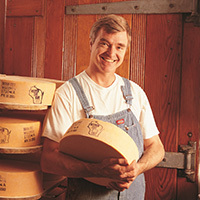 In 2002, cheesemaker Sid Cook entered his first cheese competition with the American Cheese Society in Washington, D.C. He won 12 awards, which was the most ever won by a single competitor. Carr Valley Cheese Company has continued to win numerous awards over the years and offers delicious and unique Wisconsin Cheeses, from their Aged Cheddar to their Cocoa Cardona. Certified Master Cheesemaker Sid Cook has won more top national and international awards than any other cheesemaker in North America. As a fourth-generation cheesemaker, he received his cheesemaking license when he was 16, and now owns and operates three cheese plants and seven retail cheese stores in Wisconsin. Using cow, goat, and sheep milks, Sid enjoys creating new cheeses, and Carr Valley now produces more than 50 original varieties. He crafts cheese the old-fashioned way, by hand, with a goal of producing high-quality cheese with outstanding flavor. Sid's original Snow White Goat Cheddar won the 1st place "Best of Show" Award at the 2008 American Cheese Society Competition. Carr Valley's Apple Smoked Cheddar is cured and then smoked with apple wood. It is a medium-body crisp white cheddar that slices well and has a mild cheddar flavor with a smokiness and a mellow pleasant finish. For a beautiful and tasty finish, Carr Valley hand rubs the rind with sweet paprika. Pair with whole grain mustard and porter beer. This is Carr Valley's whimsically delicious take on the famous French cheese, Morbier. This version features a layer of sheep milk cheese and a layer of goat milk cheese separated by a layer of grape vine ash and pressed together. The flavor is both delicate and rustic. Taste each layer separately and then together for three different flavor profiles in one great cheese! Pair with Chenin blanc or Riesling. This mixed-milk beauty is aged for intense flavor and a drier texture. It's dipped in a lovely wax as vibrant and green as Wisconsin's summertime pastures. It has a deep and complex taste with a smooth, creamy finish. Pair with a pinot noir, shiraz, or stout beer. Carr Valley's newest blue cheese is produced in their Glacier Point facility. Pale off-white in color, it has small openings throughout with blue mold and flecks of pepper. It is a delectable symphony of pungent cow milk bleu flavor with pepperonci peppers for a hot punch. It adds a silky fire atop burgers, pizza and steaks and is fantastic on salads. Carr Valley's well-known Gran Canaria is a sheep, goat, and cow milk cheese that is aged longer - at least 2 years. This olive oil cured specialty is a real winner. It's fruity, nutty, intense, sweet, and pungent all at the same time. Gran Canaria has been a judge's favorite! Pair with Belgian beer, apricot jam, and rosemary crackers. In Finland there is a cheese called Juustoleipa. This translates into cheese bread. Carr Valley make theirs differently, but better, with oven baking it until it has a browned crusty top. Just pop it in your oven or microwave until it glistens and serve it with your favorite dip as a delicious snack. Also pairs well with honey, jam, syrup, or coffee.